Amazon’s big fall hardware event saw the introduction of the impressive Fire TV Stick 4K and a slew of other products, but as a home theater nerd, I was most interested in the Fire TV Recast. The Recast is basically Amazon’s 2018 take on the Slingbox; it’s a chunky device that’ll let you watch live TV anywhere or record shows to a DVR for later viewing. The Recast is designed to integrate seamlessly with Amazon’s Fire TV streaming devices; your live TV channels show up in their own row on the Fire TV home screen, and you can use Alexa to change channels or schedule a DVR recording with your voice. The Recast only works with over-the-air (OTA) channels that it pulls down via a connected antenna. You can’t hook up a cable box to it. But rather, the big selling point is that the Recast will give you watch-anywhere access to ABC, CBS, Fox, and NBC, plus PBS and a couple dozen filler channels. Other companies (namely Tablo and Dish) have tried their hand at this, but Amazon’s attempt is part of a much bigger vision. 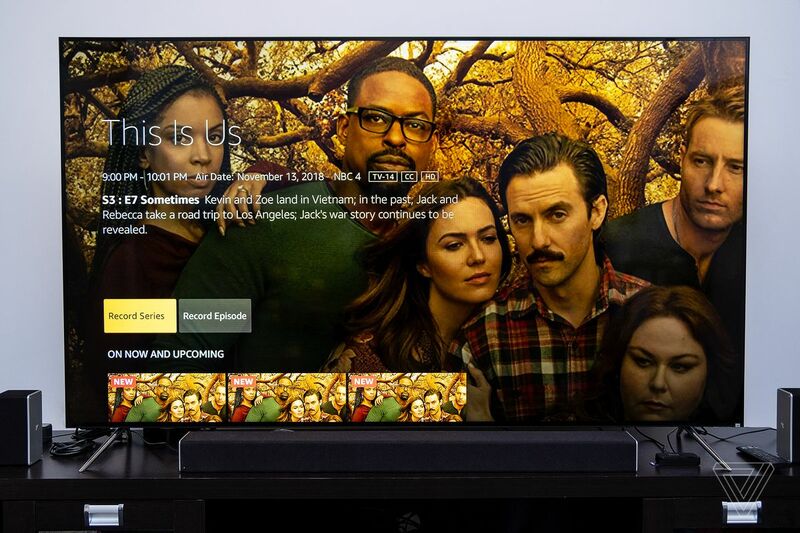 Instead of building an internet TV bundle in the style of Sling TV, Playstation Vue, or YouTube TV, Amazon is going in a different direction. Through Prime Channels, it sells subscriptions to third-party streaming services and intertwines that programming with its own Prime Video content. 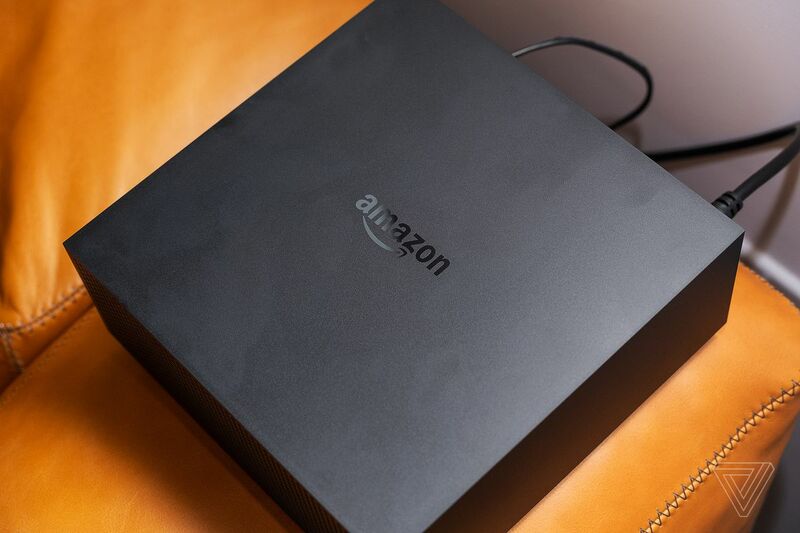 The Fire TV Recast now becomes a central fixture of Amazon’s big plan moving forward. Are the big four networks, Prime Video, and a few add-ons of your choosing (HBO, Showtime, Starz, CBS All Access, etc.) enough to keep you entertained? Everyone’s answer will be different, but I can tell you that the Fire TV Recast does exactly what it promises. There are definitely things Amazon needs to improve, but this is a solid first effort. 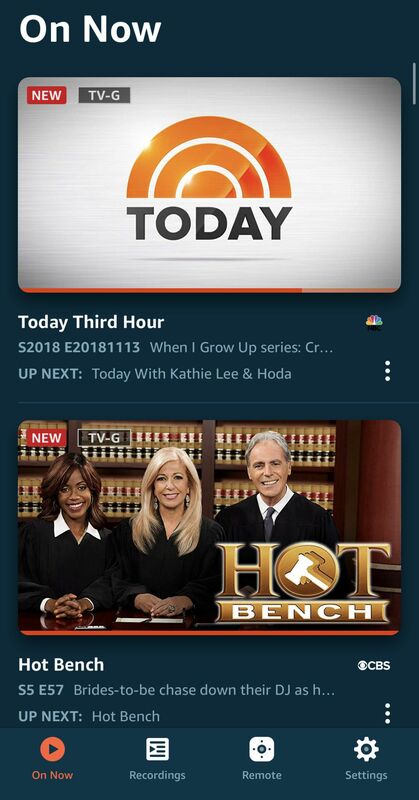 The Recast’s live TV channels show up right on the Fire TV home screen. 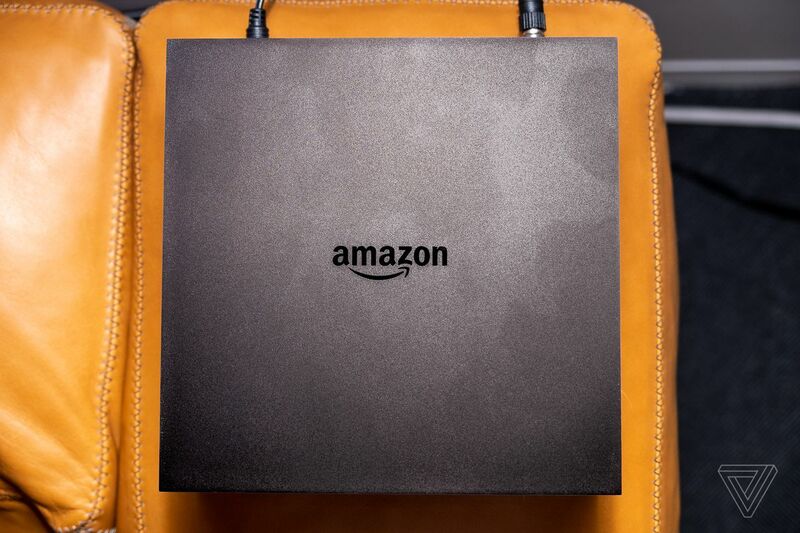 Amazon estimates the 500GB model is good for 75 hours of HD DVR recordings, with the 1TB model storing up to 150 hours. 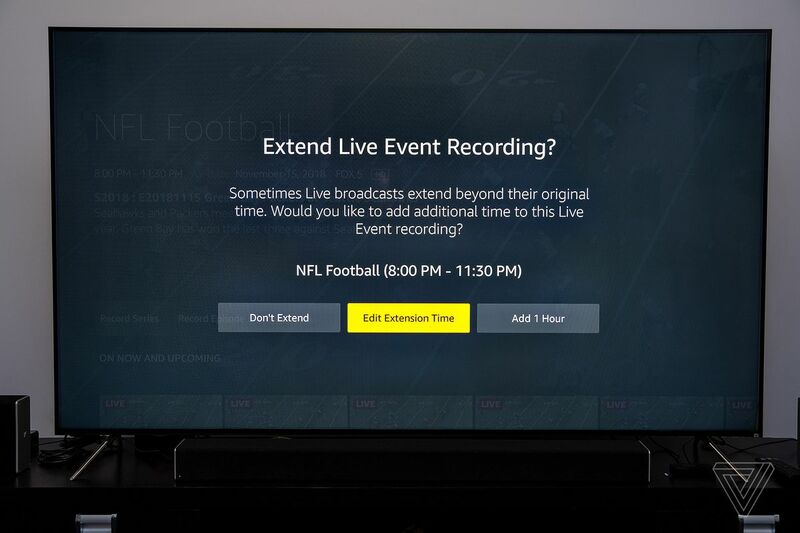 But notice how that four-tuner section makes no mention of watching live TV on four devices at once? It’s because you can’t. The biggest restriction you’ll run into when using the Recast is concurrent streams: Amazon only allows two devices to stream from it at a time. This is true whether you’re just watching prerecorded content from the DVR or streaming live programming. I really think that number should be higher, as two streams simply won’t be enough to cover many homes if people are out of the house and everyone wants to watch the Oscars or Sunday football. 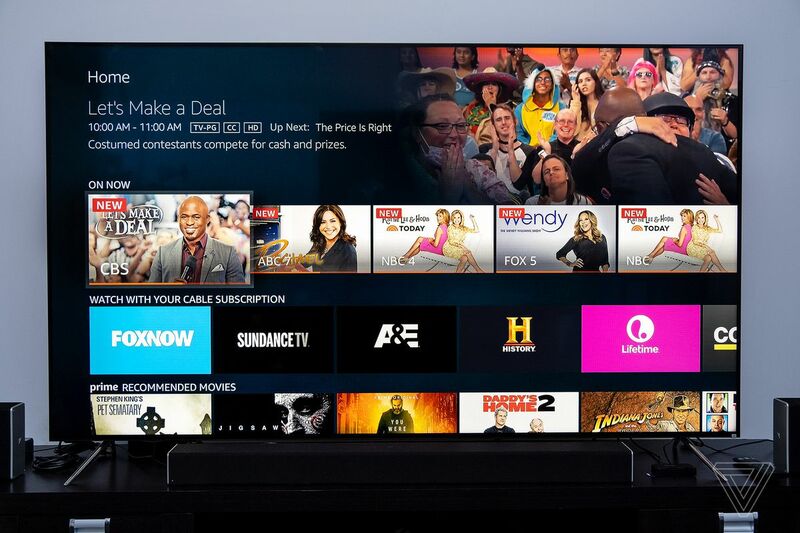 “We limit the number of streams on Fire TV Recast to two in order to guarantee the most reliable, high-quality HD streams on all your compatible devices,” an Amazon spokesperson told me, adding that the company believes “two simultaneous streams is adequate for the vast majority of households.” Amazon and I strongly disagree! It might up the limit eventually, but the company told me it’s got nothing firm to announce in the near term. 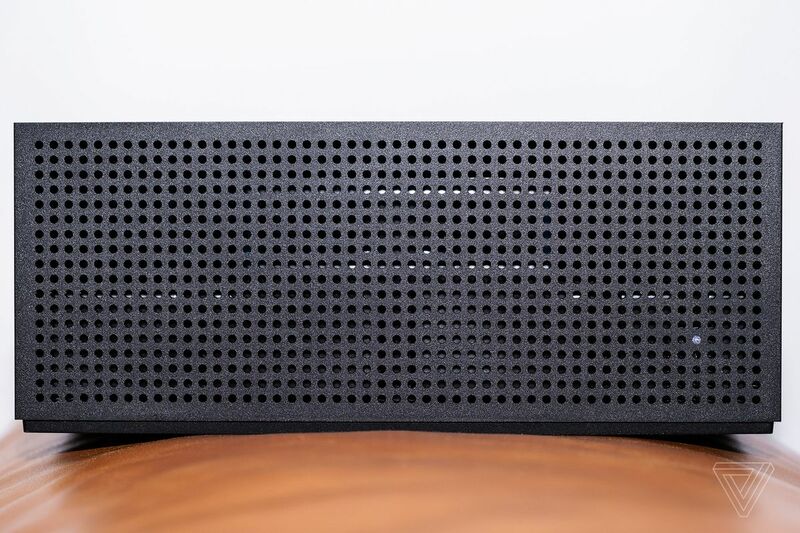 Design-wise, the Fire TV Recast is a big hulking black box with ventilation dots covering its entire front. It’s not a pretty gadget, but the idea is for you to place it in whatever spot gets the best antenna reception in your house or apartment. That means you’ll likely put it beside a window somewhere, but maybe that’ll end up being in the attic or in a bedroom. Either would be totally fine; the Recast streams live programming to your Fire TV devices wirelessly. (You can plug in ethernet for an optimal connection if you’ve got a jack near wherever the Recast goes.) If you already own an antenna, it should work just fine, and the Recast has a USB port for antennas that need power. 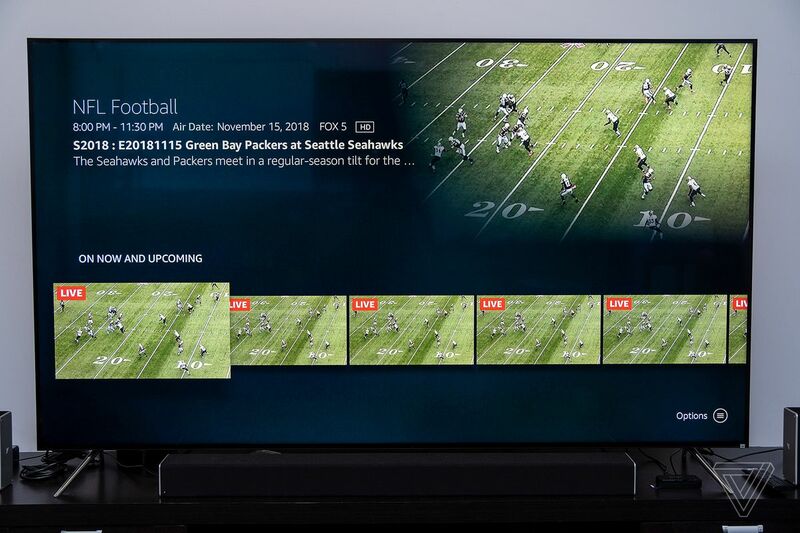 The Fire TV Recast isn’t going to be winning any design awards. 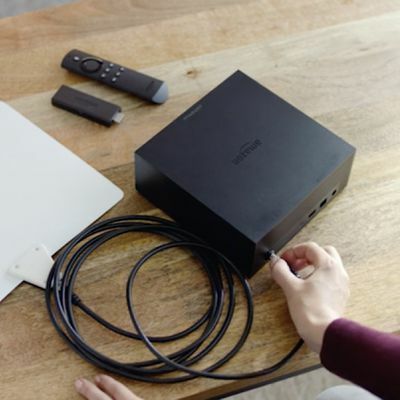 When going through the setup process, the Fire TV app will use your location to determine which direction the antenna should face for ideal signal strength. And antenna placement definitely matters; in my case, it made the difference between getting ABC and not. Once that’s done, the Recast will perform a scan of channels that are available in your area. I got two channels each for NBC and CBS, which is a thing that happens with antennas. You can pick just one of them as a favorite if the redundancy bothers you. If you’re watching on Fire TV, Amazon displays a cable-like programming guide with details provided by Gracenote. 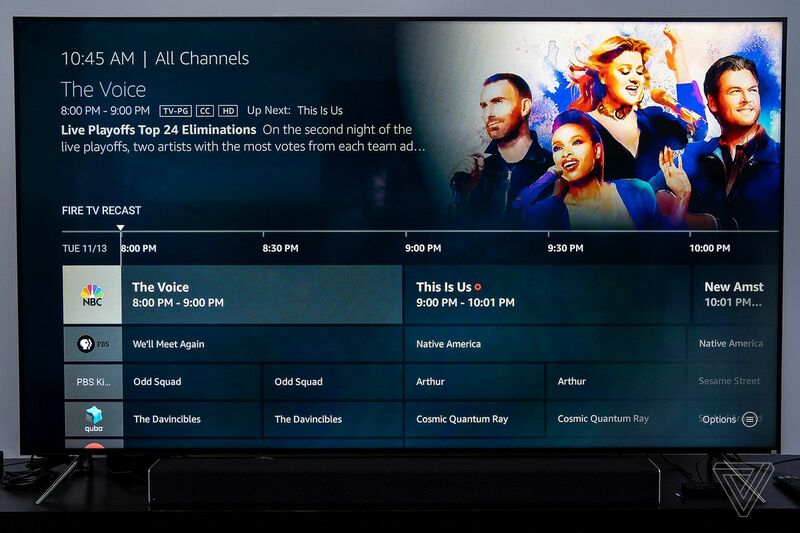 Amazon’s programming guide for the Fire TV Recast is simple to use. You can schedule recordings up to two weeks in advance, either choosing to record an episode or a whole series. More importantly, you can add some buffer recording time to the beginning or end of a program’s scheduled time slot, which is crucial for sports and live events. If you’re wondering why Amazon doesn’t do this automatically, the company says it wants to “avoid recording over a previously scheduled show or event.” When the DVR is full, the Recast will automatically start deleting the oldest content first to prevent missed recordings. You can protect recordings to keep them from being deleted. You don’t technicallyneeda Fire TV product to use the Recast. You can plug in an antenna and set up the device with the Fire TV mobile app on Android or iOS, and then use that app to start watching live programming immediately. But Amazon hamstrings this experience in several ways. You can’t schedule DVR recordings when away from home; the app can only start recording something already in progress. (Amazon tells me that it’s “actively exploring the ability to schedule future recordings on mobile.”) And the mobile app doesn’t let you hide the weird OTA channels you’ll never, ever watch; it just shows a big list of everything. You need a Fire TV to choose favorites (which don’t carry over to the app either). There’s no way to watch from a PC, unfortunately. So there are good reasons for pairing the Recast with one of Amazon’s streaming gadgets. Thankfully, the Recast is compatible with every Fire TV streaming player that the company has ever released. Performance was incredibly snappy with the Fire TV Stick 4K, but will likely vary depending on what you’ve got and how strong your Wi-Fi network is. The mobile app experience could use some serious refinement. It’s far from great, but it handles the core task of letting you watch live TV or something from the DVR without issue. Fire TV Recast creates a hidden Soft Access Point (Soft AP) which aims to avoid congesting the network traffic on your home access point. When used with another Fire TV device, Fire TV Recast uses this less congested SoftAP instead of your home network, which allows for more efficient streaming and reduces the impact to other devices on your home network. This creates a more reliable streaming experiences versus competitor. That’s all well and good, but in terms of the user experience, there’s a lot more that Amazon can do beyond the basics. As just one example, DVR’d content can’t be saved offline on a mobile device — not even on a Fire tablet. That’d be really nice to see. I’d also love a smarter way of skipping commercials beyond just fast forwarding 30 seconds at a time. After a few days with the Fire TV Recast, I can say that it works as expected. It’s an OTA DVR tailor made for people who are subscribed to Amazon Prime, who already have a Fire TV, and who are very happy with Amazon’s ecosystem. If you’re among those people, the Recast might be enticing. The question worth asking yourself is whether you like the big four networks enough to spend over $200 for the freedom to watch them anywhere. Personally, I’d still lean towards the existing internet TV services that give me those same channels as part of a bigger bundle that includes cable networks. But it’s easy to see where Amazon is headed with all of this. The margins on an internet TV service are thin. The deals necessary to build one are hard to secure and can fall apart. So instead of creating its own “internet TV” service, Amazon is trying to position itself as your entertainment hub. You can get Prime Video, you can pile on HBO and some other premium options if you want, and now you can get OTA TV. Content owners are destined to start favoring their own services over third-party bundles that they have little control over, and it seems Amazon is unconvinced it can create the one service to rule them all. It’s sure good at subscriptions, though. Apple is reportedly planning to pursue the same strategy as Amazon. Perhaps sensing that Apple is hot on its heels, Amazon can count on the Fire TV Recast as a differentiator when pitted against whatever Apple does with its TV app and third-party “channels” in 2019. Apple might similarly offer subscriptions for channels like Starz or CBS, but you’ll likely have to find your own solution for live ABC, CBS, Fox, NBC, and public stations that a lot of people find value in.